Work permits are officially known as EADs, “Employment Authorization Documents.” The table below is featured in a report issued this week by the Center for Immigration Studies (“CIS”), which, I’ll admit, is an anti-amnesty group. CIS says its report is based on information that it obtained from the US Citizenship and Immigration Services (“USCIS”) using a Freedom of Information Act (“FOIA”) request. Although CIS has an ideological ax to grind on this issue, so does virtually every politician who opines on it, so let’s assume for the sake of argument that the numbers below are accurate and worth some consideration. If the data were bogus, pro-immigration groups, who passionately take the other side of this debate, would probably be able to prove it easily with their own FOIA request. Supposedly, the law allows for 1.1 million new legal immigrants and 700,000 guest workers each year (for a sense of scale, there were 3.9 million births in the US in 2013). 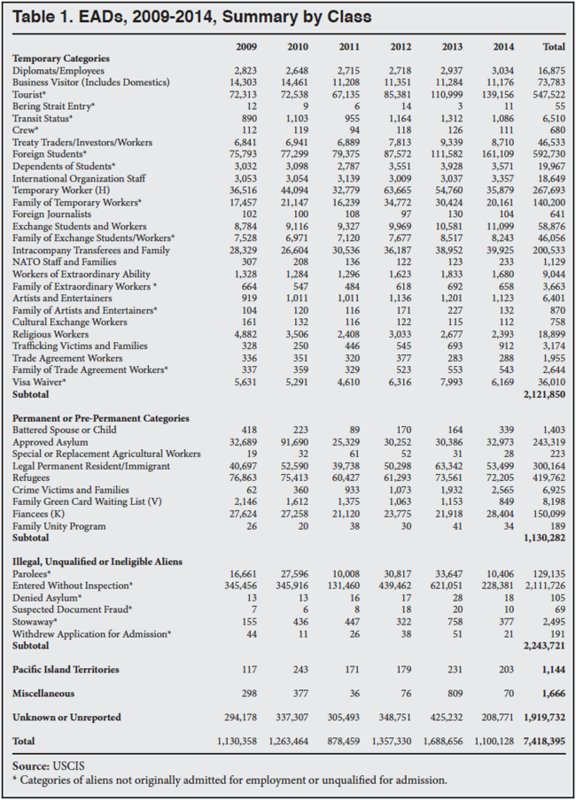 CIS claims that for the period 2009-2014 the Obama administration has given out 7.4 million work permits beyond the congressionally mandated amount (see figure at bottom right of the table). This certainly seems odd, and several of the table’s individual line items certainly don’t provide much reassurance. The first section of the table, “Temporary Categories,” has a sub-total of 2.1 million distributed work permits. According to CIS, 1.4 million of those temporary visitors fall into categories where their employment in the US is prohibited by law. For example, “Tourists” and “Foreign Students” got 547K and 593K of the work permits, respectively. 213K more went to family of both students and guest workers (the largest line item among them is “Family of Temporary Workers” at 140K). It seems reasonable to ask: Why are these people getting work permits? If enough people feel there’s a legitimate reason, they should try to change the law; until they’re able, it’s unclear why the current law should be ignored. The bottom third of the table must have had CIS analysts hopping full-bore onto the “Impeach Obama” and “Sheriff Joe Arpaio in ’16” bandwagons because within the “Illegal, Unqualified or Ineligible Aliens” section, 2.1 million work permits were given to people who “Entered Without Inspection,” which seems to mean that they sneaked across the border. In addition, 105 denied asylum, 69 suspected of document fraud, and 2,495 identified as stowaways were given work permits. Why was someone suspected of document fraud given a work permit? In 2013, 20 aliens suspected of document fraud were “waived in,” one more than hijackers on 9/11. And then there’s the penultimate line item, “Unknown or Unreported.” 1.9 million work permits were given to aliens whose status was unknown, not recorded by the adjudicator, or not disclosed by USCIS, the agency that processes the applications. The CIS reports speculates that a decent number of these permits were given to cases approved under the Temporary Protected Status (“TPS,” part of the Immigration Act of 1990) or Deferred Action for Childhood Arrivals (“DACA,” an executive order executed by President Obama in June 2012) programs. If TPS and DACA cases are captured within Unknown/Unreported, then the significant growth (and sheer numbers) in work permits to Tourists, Foreign Students, and those here flat-out illegally seems scandalous because annual issuance to those groups has just about doubled (for example, EDAs to “Entered Without Inspection was 345K in 2009 and 621K in 2013). Without knowing what the numbers looked like under Clinton and Bush, the surge in EADs makes it look as if the current administration is operating an illegal jobs program for aliens (better wording might be “an illegal alien jobs program”). The issuance of work permits is problematic even if the aliens are applying to adjust to a green card or other legal status, because the work permit essentially allows them to jump in line and work legally even before the green card or new status has been approved. This is unfair to applicants who are waiting their turn in their home country. 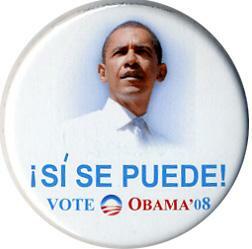 The first thing we should do is be focusing on getting jobs for Americans that are unemployed. Are we going to keep Americans on welfare and benefits while we bring in more and more foreigners to take jobs when we’ve got Americans ready and willing to take those jobs? The answer is “yes” as long as Republicans play the role of doormat. Then again, maybe enough of them are beholden to business-owning donors who want cheap labor that both parties actually don’t mind de facto, half-baked amnesty, even though it’s a big middle finger to US citizens looking for work. This entry was posted in Politics & Current Events and tagged CIS. Bookmark the permalink.